Web 2.0 has taken the internet to a new level by empowering the digital audience through applications such as YouTube, MySpace and blogs. Performance 2.0 does the same thing by empowering the audience for the performing arts. Could it be the killer application that will revitalise classical music? Performance 2.0 has been around for a long time. My header photo shows Sokol exercises being performed in the Bohemian city of Tábor in 1903. 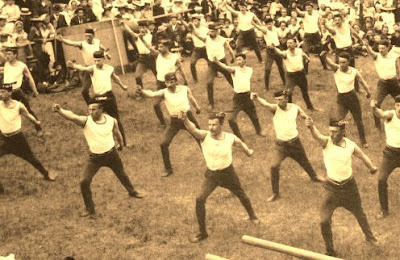 Sokol was a Czech communal exercise movement founded in 1862. At the height of its popularity it had 750,000 members using 1100 gymnasia which also housed libraries, art exhibitions and concerts. Because of its egalitarian and democratic roots Sokol was outlawed during both the Nazi and Communist occupations of Czechoslovakia. But it still continues today and a branch of the movement in the UK is mounting Sokol displays at sites of modern architecture and flash events in major cities. The highly paid celebrity performer set on a pedestal in auditorium performances and recordings is strictly Performance 1.0. Perfection is out, participation is in. Chorales sung by the congregation are one of the oldest expressions of Performance 2.0. In the twentieth century Benjamin Britten showed how everybody can make music. Cornelius Cardew's pioneering Scratch Orchestra of 1969 presaged a boom in scratch choirs and orchestras that continues today. The emergence of classical music YouTubified is pure Performance 2.0. Tangible proof that Performance 2.0 could be the killer application for classical music is the huge popularity of community choirs in France sparked by the film 2004 The Chorus. The screen-grab below is from another remarkable example of Performance 2.0. It is a project that has not received the attention it deserves, which is surprising considering that it involved Simon Rattle and the Berlin Philharmonic. I wrote about Rhythm Is It! shortly after its 2004 release. The ingredients are a disused bus depot in a blighted Berlin suburb, two hundred and fifty teenagers from tough city neighbourhoods dancing to Stravinsky’s Rite of Spring played by the Berliner Philharmonic under Simon Rattle, and specially commissioned music from composer Karim Sebastian Elias plus a contribution from Berlin underground rock band The Wickeds. The DVD of Rhythm Is It! only seems to be available in Germany. But catch it in a theatre or watch this trailer to understand what Performance 2.0 is all about. And remember, dance is not an inferior art form. Very good post. Come on, why not celebrate amateurism? For instance PORTSMOUTH SINFONIA – Also sprach Zarathustra op.31. Brian Eno produced that record. Players had to be either non-musicians, or if a musician, play an instrument that was entirely new to them. "And remember, dance is not an inferior art form." Very interesting post, as always, pliable. Perhaps in reaction to having granted both Elliott Carter and Milton Babbitt honorary musical doctorate degrees in the same year,1968, my undergraduate college decided a few years later to combine its Music and Dance undergradute programs. It has taken me years to understand this move, but now I believe that I do. "An investigation of a small number of styles drawn from different historical periods and cultures in order to introduce students to historical musicology, ethnomusicology, and dance history and dance ethnography. Designed to foster collaboration between music and dance faculty and students. Required of all prospective majors and minors in both disciplines before the junior year."